Aravindan (January 21, 1935–March 15, 1991) was an iconoclast filmmaker who was deeply rooted in Indian culture, the Malayalam sub milieu of Indian arts and aesthetics of film, painting, music and theatre. While he was famous as a filmmaker across India, for Keralites he was also a well-known cartoonist, painter and a prominent figure in Malayali theatre who explored the traditional theatre form, presenting it in a contemporary style. His establishment of thanathu natakavedi (original/own theatre) transformed the Ibsenesque theatre of Kerala and his cartoon series—which were on the last pages of the Mathrubhumi weekly—turned him into one of the most noted commentators on contemporary Malayali social life, much before he entered filmmaking. Aravindan was a combination of tradition and modernity—a unique cultural trait of his times, and indeed, did it all differently. The 11 films Aravindan directed form only a small part of his total contribution towards Indian art. He also made 10 documentaries, was a musician and a prolific painter, which added to his unique stature in the field of visual and related arts. The Kerala of the 1970s was different from today. New writings focused on existential philosophy, the film society movement was born and the Keralites who voted for the first communist government were surprised to see the landless getting land across the state. By the early 1970s, a ‘new wave’ of films had also hit the cultural scene of India. Empowered by the training and education received at the Film and Television Institute of India (FTII), filmmakers such as Mani Kaul, Kumar Shahani and Adoor Gopalakrishnan disrupted the scenario, and stood apart from even the likes of Satyajit Ray, Ritwik Ghatak and Mrinal Sen. Aravindan, a keen observer of the cultural scene of the country, was also drawn into the world of films. As a creative person from an artistic background, his interests lay in using emerging art forms such as filmmaking—which were in tune with the sensibilities of his paintings, music and theatre. 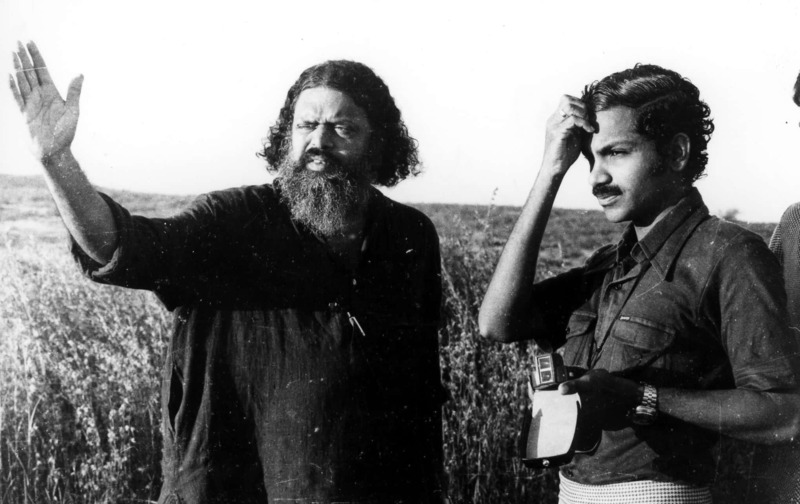 Mankada Ravi Varma, the cinematographer of his first film Uttarayanam (1975), wrote in an article that the shooting set was also a festival of the men of culture, and they all celebrated it by visiting the set as a new work of Aravindan in a new medium. The film bagged the Special Jury Prize at the National Film Festival. The cultural awakening of the 1970s in Kerala also saw a cashew exporter and producer, Ravindranathan Nair, patronising both Aravindan and Adoor Gopalakrishnan. The most memorable and remarkable films by Aravindan and Gopalakrishnan were produced by Nair. Most of Aravindan’s films, including Kachana Sita (1977), Thampu (1978), Kummatty (1979), Esthappan (1980) and the unique musical Pokkuveyil (1982), were all funded by the generous producer. The same journal, while reviewing his mystic film Esthappan, wrote that Aravindan’s films ‘constitute India’s cinema of the inner life’. With almost all of his films bagging a national or a state award, Aravindan—along with Gopalakrishnan and John Abraham—was part of the triumvirate of Malayalam films. These three globally acclaimed filmmakers represented different styles, rather than streams of Malayalam cinema, which no one has matched or excelled at even today. Interestingly, among the three, Aravindan was the only filmmaker who wasn’t professionally trained, but he is still counted in the same breath as the FTII-trained filmmakers and hailed by ‘new wave’ filmmakers such as Mani Kaul. This article was also published on The Telegraph (Online). [i] Mani Kaul, 'A Director and a Gentleman', The Times of India, New Delhi, March 17, 1991. [ii] Chidananda Das Gupta, 'New Directions in Indian Cinema', Film Quarterly, vol. 34, no. 1 (Autumn 1980): 32–42. [iii] Satti Khanna, 'Review: Esthappan by Aravindan, General Pictures', Film Quarterly, vol. 35, no. 1 (Autumn 1981): 53–56.